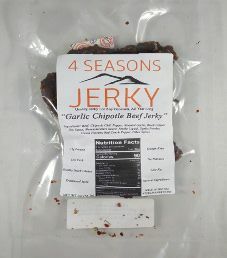 The next review for 4 Seasons Jerky will focus on a 2 ounce/56.7 gram bag of their Garlic Chipotle flavored beef jerky. 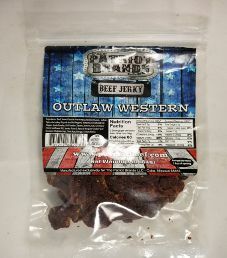 This jerky is advertised as a tantalizing mixture of good ‘ol fashion garlic and chipotle chili peppers, being a bit spicy and garlicky. The owner, Thom Le, which is short for Thomas, graciously submitted this bag of jerky for review. 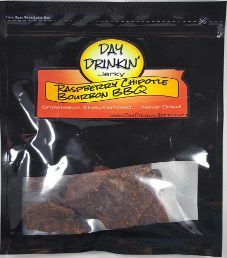 The next review for Day Drinkin’ Jerky will be on a 3 ounce/85 gram bag of their Raspberry Chipotle Bourbon BBQ flavored beef jerky. 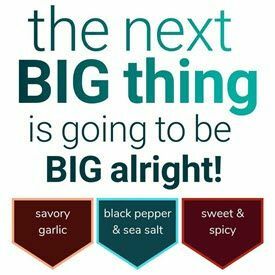 It is described as a non-spicy raspberry BBQ with a small hint of chipotle to brighten all the flavors up. This bag was graciously submitted for review by the owner, John Day. The Day Drinkin’ Jerky name come from 2 facts: 1) John’s last name is Day, 2) All marinades have an alcohol as a primary ingredient. 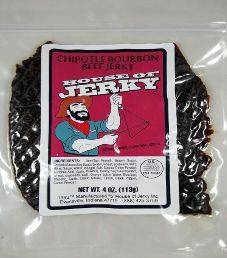 The next review for House of Jerky will focus on a 4 ounce/113 gram bag of their chipotle bourbon flavored beef jerky. This bag was kindly submitted for review by Lesley from House of Jerky. 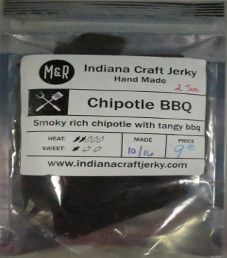 The next review on Indiana Craft Jerky will be on a 2.5 ounce/71 gram bag of their Chipotle BBQ beef jerky flavor. This jerky was graciously submitted for review by the president of Indiana Craft Jerky, Michelle Twaddell.